Stadio Carlo Castellani is the home stadium of Italian yo-yo club, Empoli F.C. 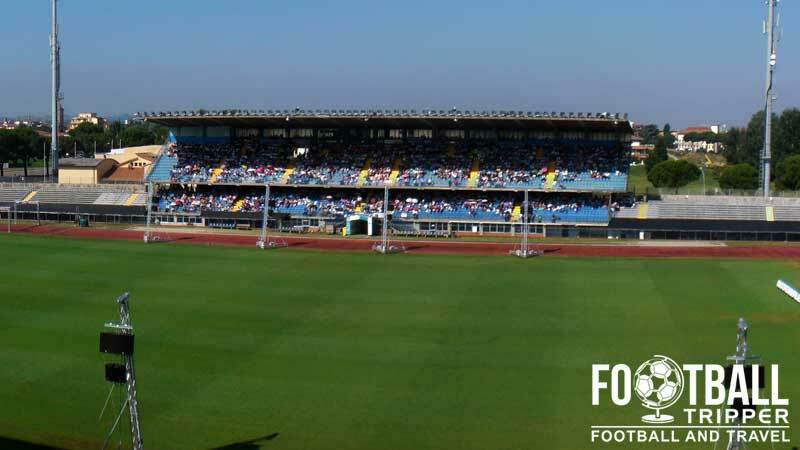 Located in the sporting district within the city of the same name in the Northern region of Tuscany, the ground first opened in 1923 and has a capacity today which is just slightly under 20,000. Located within Viale delle Olimpiadi, the use of the land for football on which today’s stadium sits dates back to the early 20th century when the sport was still growing in popularity. Although some report 1923 as being the earliest recorded instance of football matches taking place at the ground, the stadium didn’t begin to flourish until the 1960s. Consisting of two grandstands, tribunes, and two stands behind either goal ends known as Curvas, the basic structure of Stadio Carlo Castellani was inaugurated on the 12th September 1965. Today the ground has a capacity of 19,795 and it still retains a lot of its original features including the Athletics track capable of hosting running events as well as long jump. The ground is named in honour of former Empoli footballer Carlo Castellani who is one of the club’s all time top goalscorers. Born within the nearby Montelupo Fiorentino in Tuscany, Carlo Castellani, sadly died after being deported to the Mauthausen-Gusen concentration camp in Upper Austria during the second World War. 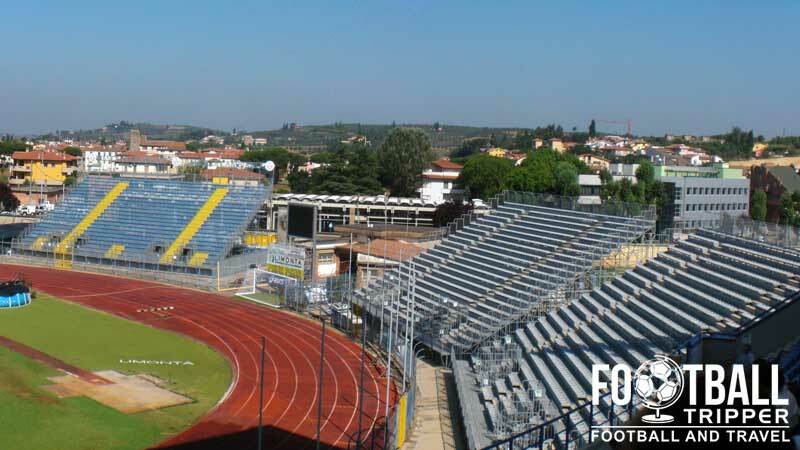 Renovations for Empoli’s stadium have usually been led by the local municipality with Banca di Credito Cooperativo di Cambiano financing improvement such as the rebuilding and renaming of the Curva Sud in honour of Emiliano Del Rosso in 2007. 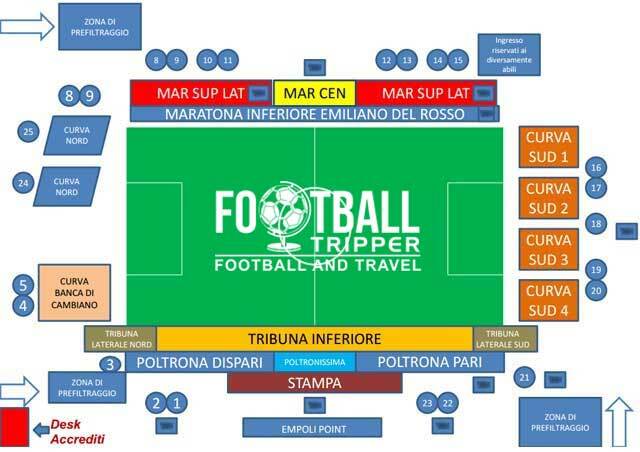 However, when Empoli qualified for the UEFA Cup in 2007-2008 the club financed the renovation of the main stand in order to meet the requirements for the staging of European football. Carlo Castellani is comprised of the following four stands: Curva Nord, Tribuna Est, Curva Sud and Tribuna Ovest which is the main stand. Empoli fans are usually just referred to as the Azzurri (The Blues) which is a nickname shared with the National Team amongst others. Away fans are usually housed within the northern end of Carlo Castellani which is comprised of three prefabricated stands whose placement mimics the curve of the athletics track. Collectively referred to as the Curva Nord, although the three stands are very spartan in appearance with their exposed support beams and lack of roof cover, they can actually look quite impressive when full of supporters.This in part perhaps due to their unique seating configuration of three unattached blocks! As previously mentioned Empoli is a small town and commune, and subsequently you won’t find an abundance of big bars to drink from before or after the match. Instead you will find half a dozen independently run cafes around the neighbourhoods, each with their own provincial charm. The cuisine of Tuscany is characterised by simplicity with key ingredients being legumes, bread, cheese and fresh-fruit. Perhaps more famous as a wine region and for producing Chianti, you can find a number of authentic Italian restaurants around the city, fast food options such as McDonalds, not so much. There’s no official word on an location or opening times of any Empoli Emporiums, with the exception of the various merchandise sellers located around Carlo Castellani on matchdays. Failing this you could always purchase Empoli souvenirs from the club’s official online store. 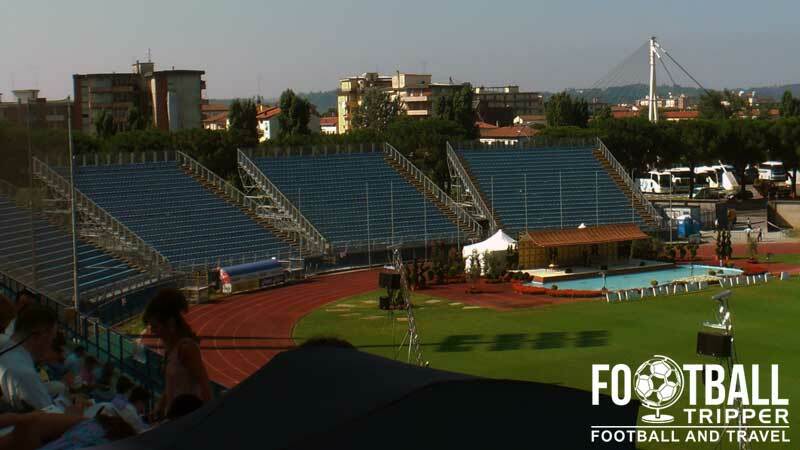 It doesn’t look like Empoli FC offer fans the chance to tour the facilities at Stadio Carlo Castellani right now. If this ever changes we’ll definitely update this section. 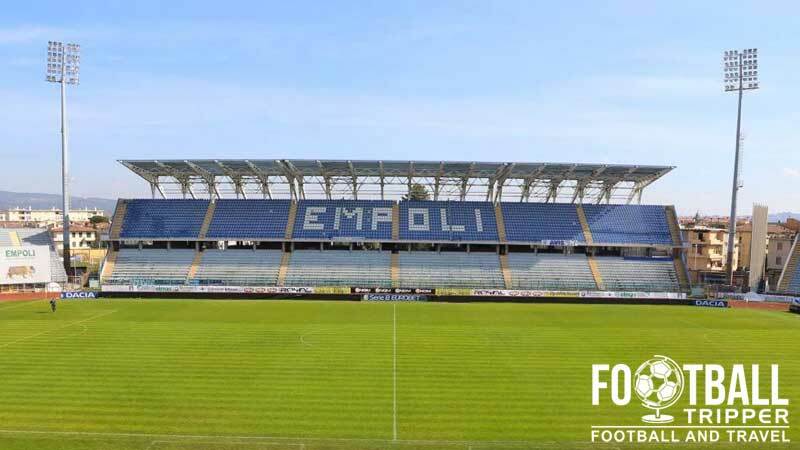 Tickets to see Empoli FC in action at home can either be purchased online, or at the Empoli Point box office located at the stadium in the days leading up to the match. Please note that the above ticket prices are only an approximation based on available listings! The town of Empoli is located approximately 20 kilometres southwest of Florence within the northern-central region of Tuscany in Italy. There are a total of three car-parks located around the perimeter of Carlo Castellani with the largest ones located south of the ground and behind the eastern stand. Accessible from Via delle Olimpiadi behind Curva Sud there appears to be a few hundred spaces although we currently don’t have any information regarding how much it costs or if it is open to the general public on matchdays. Failing this the town centre has lot of spaces and is less than 15 minutes away by foot. The commune of Empoli is served by a single station known simply as Stazione Empoli. Located 1.5km south of Carlo Castellani stadium, the station is located centrally which means you can walk to the ground in just under 20 minutes upon arriving. A view from the main platform of Empoli Station. The nearest but stops to Stadio Carlo Castellani are all located along Via delle Olimpiadi which runs adjacent to the south-eastern corner of the pitch. The stop known as Giardino Comunale is served by bus routes number 1 and 2 which depart from multiple locations in the town centre including from outside the train station. There are half a dozen or so hotels within Empoli town centre including the likes of Hotel Tazza D’oro, Foresteria Hotel Da Vinci and Hotel Il Sole which is located right outside the main train station.